Fair Flavors: Whole30, day 14: Lunch in the sunshine! If you've read more of my posts, you know that I love all things curried. Today I decided on a very easy curry soup, with some leftover ingredients. You can make this soup with just about any kind of stock. My favorite is shrimp, but that's not something I have around the house a lot. Another good one is chicken, but ordinary fish stock is fine too. It depends on your preference. Today I was lucky, because a few weeks ago we had lobster for dinner and I put the empty shells in the freezer. Today I took them out and simmered them in water for 45 minutes. Voila: simple lobster stock. 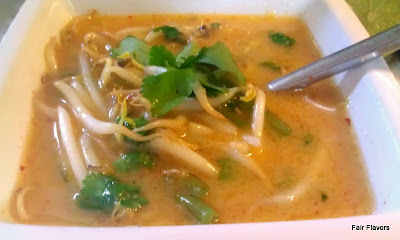 This soup is quite spicy, because of the curry paste I used (Mae Ploy, red paste). You can choose a milder paste, or use less paste. But I think that anything less than half a tablespoon will not give enough flavor. Today, I chose not to put meat or fish in this soup, but you could add some protein if you like. Shrimp, chicken, beef or even boiled egg are a very nice addition. Since I had enough protein for breakfast and knew I would eat lots of protein again for dinner, I skipped it for lunch. Heat the stock with the coconut milk and add the curry paste and salt. Mix well. Add the vegetables (and fish/meat if you want), bring to a boil, lower heat and let it simmer until the vegetables are done. In my case, I added the bean sprouts later, because I like them when they are still crunchy. Taste the soup, if you think it needs more salt, you can add it. Just before serving, add a splash of lime juice and the cilantro. And that's it. Incredibly easy, but incredibly good. And very Whole30!